Remember the days when finding a good place for the remote was your biggest home-entertainment storage dilemma? But wait – as the infomercials say – there's more! Now you can also be entertained at home with an ever-expanding array of attention-absorbing options such as DVD movies, TiVo-recorded programs and video games. And in addition to more stuff, everything's gotten bigger. As TV screen sizes keep growing, the essential entertainment center has morphed into the humongous home-theater system. Fortunately, with a little self-control and the right storage solutions, you can prevent multimedia clutter from taking over your home. No doubt you've heard that everything will soon be wireless. Of course, long ago, it was also accepted as truth that computers would soon create the paperless office. So it's probably safe to assume that “soon” will never come soon enough. FlipWorks Multimedia Storage Tray will store all types of media packaging ranging from VHS tapes to CDs and Zip disks. The units fit in drawersor on shelves. Prices range from $7 to $20.At www.rockler.com. How to corral all the cords needed to run today's multimedia? The Cord Cover Kit features paintable PVC that attaches above baseboards. Cost is $15.At www.homefocuscatalog.com. If you've got gamers in your household, you've probably got video-game clutter. Thankfully there are now storage solutions expressly designed to accommodate the consoles and accessories of PlayStation, Xbox, GameBoy and other popular digital diversions. Atlantic's 3-Tier Wire Gaming Rack ($40) has space for up to three consoles, two to six controllers, and 30 games in a compact space (20 inches wide by 14-½ inches deep by 19-½ inches high). 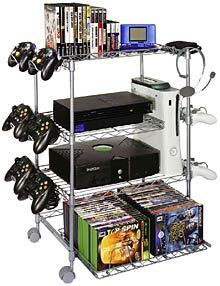 The rolling 4-Tier Wire Gaming Tower ($60) holds the same number of consoles and controllers but offers room for 70 games (21 inches wide by 15-½ inches deep by 30 inches high) and includes a slide-out shelf. SOURCE: Atlantic – www.atlantic-inc.com 562-903-9550. Luckily, taming your tangled jungle of cords and cables isn't as tough as it used to be, thanks to several innovative and affordable products. The WireMate ($20) offers the most streamlined solution for both controlling and camouflaging multiple strands and sizes of cords. Designed to organize and hide up to 18 wires of varying thicknesses, the sleek, high-impact plastic case (14 inches long by 8 inches wide by 2 inches deep) mounts easily with screws or double-sided tape on a flat surface such as a wall or the back of an entertainment center (all mounting materials are included). SOURCE: Innovative Problem Solvers – www.wiremate.com (212) 867-6020. If you only need to cover up a couple of cords, the Cover Cord Kit ($15) lets you tuck your wires away into a system of long “channels” designed to fit atop baseboards or along other wall surfaces. Constructed of adhesive-backed white PVC (paintable to match your decor), the kit's snap-together components include four 36-inch lengths of channel (which can be cut to size), two inside corners, two outside corners, two flat corners and three couplings. SOURCE: Home Focus Catalog – www.homefocuscatalog.com (800) 221-6771. For corralling individual strands of cable or other wiring, Cable YoYos ($15, set of three) are a compact way to conceal cords. Each “YoYo” case is a mere quarter-inch thick and 3 1/8 inches square yet holds up to 6 feet of coiled cable and attaches to most surfaces with self-stick tabs. The cases can be stacked or lined up in a row to create a neat network of cables. SOURCE: Solutions Catalog – www.solutionscatalog.com (800) 342-9988. Depending on your needs and the amount of room you have, your best bet may be a TV shelving unit that can be supplemented by a matching audio stand. A good selection of well-designed examples in a wide variety of styles can be found online at Ergo In Demand (www.ergoindemand.com 800-888-6024). Among their roomiest options are the chrome and glass Big Screen Entertainment Center ($340; audio stand, $275), measuring 20 inches high by 59 1/8 inches wide by 17¾ inches deep; and the cherry-veneer TV Cabinet Stand ($395; audio stand, $405), which measures 20 1/8 inches high by 57 7/8 inches wide by 22 1/8 inches deep and even includes a small drawer for those pesky remotes. A more compact version, the Wooden TV Cabinet ($270; audio stand, $405), measures 31 inches high by 31 5/8 inches wide by 20 inches deep and has a larger drawer suitable for media storage. Another option is the Stratos Collection Bush Home Theater ($475; Wal-Mart), 71½ inches high by 72½ inches wide by 20½ inches deep, which accommodates up to a 65-inch projection TV and offers concealed and open storage, adjustable shelves and built-in lights. Other types of entertainment equipment storage units are modular, allowing you to create more customized configurations. 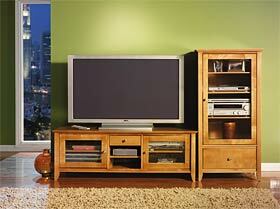 Can-Am (www.avcabinet.com (800) 387-9790) has a seemingly infinite range of modular home theater furnishings. You can have as many or as few drawers and shelves as you want, with variations such as flip doors, sliding doors, pull-out shelves and locking wheels. All units are constructed of powder-coated steel (satin or gloss finish) and come in 16 color choices. The Web site also offers a helpful “Go Configure” page that lets you conceptualize which modules might work for your space. For the insatiable collector of music, movies, games or other disc-based entertainment, there are numerous types of multimedia storage systems to choose from. Major retailers now carry a wide selection of these products, and hundreds of online stores such as StoreYourMedia.com have sprung up to offer even more. One of the most versatile products in this category is the FlipWorks Multimedia Storage Tray ($7 to $20), which accommodates virtually every type of media packaging: Disney and regular VHS tapes; all DVDs; CD packaging, whether commercial or home produced; audiocassettes; 3.5-inch diskettes; Zip disks – all different sizes of media formats can be stored together. Equally at home on a shelf or in a drawer, the unit (available in single, double and triple sizes) can be converted into a pullout tray by adding FlipWorks Slides ($6/pair). All trays have a depth, front to back, of 16 inches. The width of a single tray is 6¾ inches; a double tray is 13 5/8 inches wide; and a triple tray is 20 1/8 inches wide. SOURCE: Rockler – www.rockler.com (800) 279-4441. A different kind of versatility can be found in the Two-Panel CD Screen ($50), which functions as a combination privacy screen and CD storage unit. Ideal for dorm rooms and other shared spaces, the black-framed screen displays 54 CDs and measures four-fifths of an inch deep by 45 1/8 inches wide by 68½ inches high. Finally, if you're an “analog animal” who can't bear to get rid of your favorite old LPs but are short on storage space, consider the compact, rolling Record Albums Cabinet ($108), made of solid hardwood that's sturdy enough to double as a low seat or footstool (17½ inches high by 20 inches wide by 18 inches deep). SOURCE: The Jungles – www.thejungles.com (909) 396-5972. Harriet Schechter is founder of The Miracle Worker Organizing Service and author of three books, including “Let Go of Clutter” (McGraw-Hill). Her online advice column is at www.MiracleOrganizing.com.